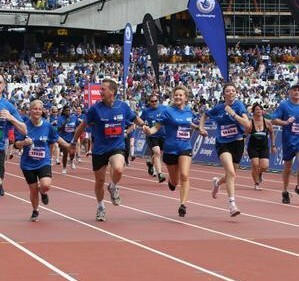 On Sunday 21st July, to help celebrate a year since the Olympics, the National Lottery staged a 5-mile run around the Olympic Park (finishing on the track in the stadium!). Amongst the participants were Jubilee Hall staff, members, their partners, children and friends. The Olympic anniversary celebrations continue on the weekend of 26th-28th July with athletics in the stadium and the Ride London 100-mile cycle on Sunday 4th August.